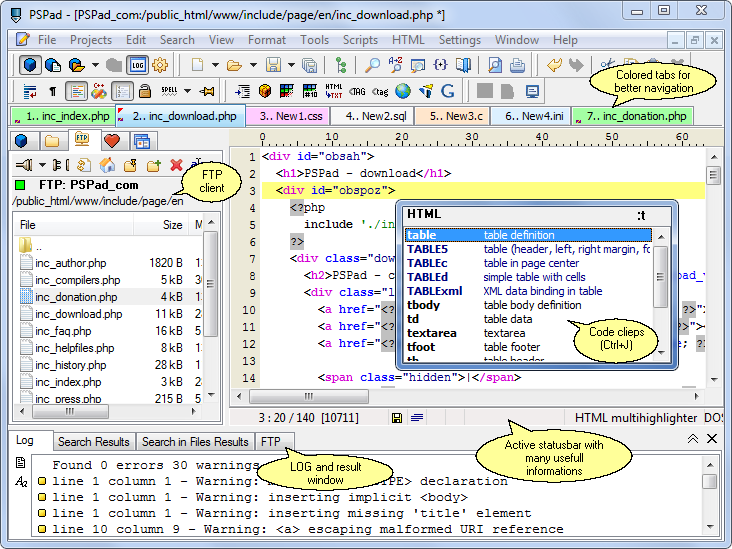 PSPad is a universal freeware editor. There is no complex install process; the program is ready to work immediately, without requiring customization. It supports many file types and languages, with syntax highlighting. There are macros, clip files and templates to automate repetitive activities. An integrated HEX Editor, Project support, FTP Client, Macro Recorder, File Search/Replace, Code Explorer, code page conversion, are just some of the many possibilities that PSPad can offer you. I can declare that PSPad installer from the 4.5.9 version (March 1ts 2015), downloaded from PSPad pages links doesn't contain any bundled software. PSPad and installers are signed with code signing certificate, issued by COMODO. Sorry ROY, but you lie. There is NO SILENT install in case you use as source of your installer PSPad page. If you download PSPad from any software server, they wrap PSpad installer into they own downloader. In this case I can't be responsible of it. The new installer includes KNOWN MALWARE (specifically Conduit) that SILENTLY INSTALLS even if you choose "No" to the install options. I tracked this on a firewall with content filtering that blocks known malware purveyors. You will get a popup that says the installer is unable to download content and an option to continue. If you continue, the editor itself installs. This app and author should be blacklisted until the malware is removed from the install. ONE star for knowingly infecting users with malware. From author's page you can update/upgrade to - PSPad editor 4.5.8 (2453). This is still an excellent editor, but unfortunately it doesn't come anywhere near Notepad++. My main problem is that it is STILL designed as a coder's editor with monospaced font capability only. 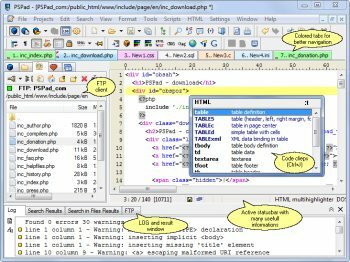 I write code in Notepad++ using Verdana 9. If you need monospaced fonts to line stuff up, fine, allow that as an option - don't force it on your users. Still, 5 stars for being free and having lots of features. so we are rating the package/installer or the application itself. Go to their site and get the .cab file insteat, open it with 7zip and get the (portable) content out and you have it free of "spyware" as you call it. Enjoy this free, wonderful, software! @roj: Sadly, this is what 'freeware' has become. People want everything for free, BUT at some point a price is paid. Whether it is in the security and integrity of your PC (or the PC's of others that fall for bundle tricks), or support, or whatever... The 'snake' finally wandered into the garden, and that snake was in the form of bundles. Now they are everywhere, and NOT coming just from vendors. Thanks to CNET, the practice of download sites wrapping downloads in bundles is now common-place. I have the philosophical view that all these type bundles are deceptive in nature because they hope, rely, and encourage the user to accidentally install whatever the bundle is. Meanwhile, the user has no intent to download or install anything but the application in question. If they wanted whatever the bundle was, they'd go get it. Just my two cents. The RECOMMENDED Quick Install option wil SILENTLY install the BABYLON TOOLBAR into IE and Firefox. The installer is specifically tailored to do a SILENT install. If you choose the CUSTOM install, you will find three options to disable this intrusion. ONE star until you get rid of this or PROMINENTLY inform users of your deception in the install prompts. There is only one problem I have with the current 4.5.5 release. For some reason, in my dual-monitor setup, it will not load onto the secondary monitor. Never had the problem with 4.5.4 and I am hoping it's just a temporary proble. Otherwise, it is by far the best "notepad" replacement out there. Absolutely fantastic text editor. The only dealbreaker to using this (if you care) is the fact that you are forced to use fixed-width fonts as its geared towards coding. Frankly, even when I'm writing PHP I prefer using Verdana 9, but whatever. Still gets 5 stars for its capabilities and for being free. This release finally weaned me off of CONText editor (I jumped off the bloated UltraEdit bandwagon years ago). The final addresses all my issues including 64bit integration and I'm very satisfied. Simply the best full blown text editor. As far as I am concerned, I don't care if it's called alpha, beta or blob. PSPad works well, and I've never had any major issues with the many builds I've used. Compared to commercial editors such as UltraEdit and TextPad, PSPad has nothing to be ashamed about (in fact TextPad doesn't even come close), and it's free. I tried notepad++ for a short while, but returned to PSPad rather swiftly, and it looks like it will remain my de-facto editor of choice for some time. Very well done Jan, keep up the excellent work. Somebody can name it as beta, somebody as small builds between full releases.